"The idea that we should negotiate pipeline routes through Armenia in exchange for Armenia militarily freeing our territories is simply not a wise strategy. I'm against it." Ilham Aliyev, VP-Foreign Economic Relations of SOCAR (State Oil Company of Azerbaijan Republic) and son of the President of Azerbaijan, in an interview with "Azerbaijan International" in Baku. "Let's be realistic. One cannot criticize Azerbaijan's rights to develop its own oil fields insisting that legal issues of the Caspian Sea have not yet been resolved, while at the same time seeking permission to participate in developing these fields. Nor can one be regarded as a reliable partner in regional cooperation and, at the same time, continue a policy of militarily occupying a significant part of Azerbaijan territory, leaving 1 million refugees homeless, destroying hundreds of cities and villages and carrying out a policy of vandalism." 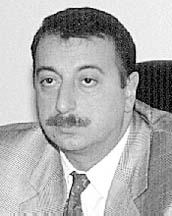 Ilham Aliyev, VP of the State Oil Company of Azerbaijan (SOCAR), as the keynote luncheon speaker at the Caspian Pipelines Conference November 19, 1997, in Washington, D.C.
"What Section 907 [of the Freedom Support Act] means to Azerbaijan is that we are the only country among the 15 Republics of the former Soviet Union which is being deprived of direct U.S. assistance. For instance, the Armenian government gets approximately $100 million each year from the United States. Our government receives nothing. "Azeris want to know why the Armenian lobby is so influential. What is the U.S. Congress afraid of? Is this lobby stronger than justice or truth or even elementary logic? Is it more important than future gigantic joint projects between Azerbaijan and the United States? "If we consider the consequences of this war between Armenia and Azerbaijan, it is obvious that Azerbaijan, not Armenia, is the victim of this war. Nearly 20 percent of our land, not theirs, is being occupied by foreign troops. Six of our regions, not theirs, outside of Nagorno-Karabakh are under occupation. Nearly one million of our people, not theirs, live as refugees. And our historical heritage, our buildings, our homes, our schools, our mosques, our cemeteries and the graves of our ancestors, not theirs, are the ones being destroyed by vandals." Ilham Aliyev, Executive Vice President of the State Oil Company of Azerbaijan in Washington, D.C., speaking at a luncheon at the Washington Institute for Near Eastern Policy on November 17, 1998.